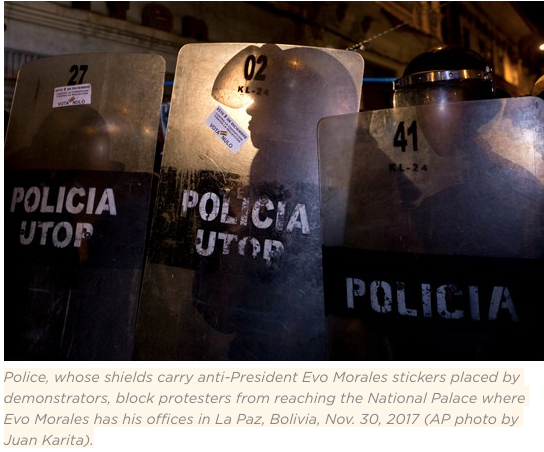 In September, Bolivian President Evo Morales signed a long-anticipated law enacting reforms to the country’s justice system, which consistently ranks among the worst in the Western Hemisphere. The law aims to alleviate heavy caseloads for judges and reduce long wait times for cases to be resolved, but it fails to address many of the systemic issues plaguing the Bolivian judiciary. In an interview with WPR, Ramiro Orias, a La Paz-based lawyer and program officer for the Due Process of Law Foundation, discusses the new reform initiative and explains why its implementation so far does not inspire confidence. World Politics Review: What led the Morales government to make this push for judicial reform, and what does the reform legislation accomplish? Ramiro Orias: On Sept. 27, President Evo Morales signed into law a judicial reform bill that creates regional constitutional courts in each of Bolivia’s nine departments, or regions, overseen by the country’s Plurinational Constitutional Court. All told, the law establishes 22 new constitutional courts in the country, aimed at more effectively ensuring the protection of Bolivians’ fundamental rights under the constitution, such as the right to habeas corpus and the right to challenge the legality of government actions. Each of the regional constitutional courts established by the reform law will include two judges with a specialized level of knowledge and experience regarding constitutional law. These new constitutional judges will be overseen by the Bolivian Judicial Council, the governing body that oversees the training of judges, with the participation of the national universities. The goal of establishing these new constitutional courts is to alleviate the procedural burden and reduce delays in resolving cases that touch on constitutional issues. Current conditions in Bolivian courts amount to a serious judicial crisis, which negatively affects citizens’ experiences with the judicial system and their ability to guarantee that their own rights are protected. As a result, the Bolivian judiciary has one of the highest rates of disapproval from its own citizens. A Latinobarometro survey from last year found that only 23 percent of Bolivians have confidence in the country’s judicial system. In the World Justice Project’s 2018 Rule of Law Index, Bolivia’s justice system was ranked 106th out of 113 countries. The only country in the Western Hemisphere that ranked lower than Bolivia was Venezuela. The Bolivian government is trying to address this challenging situation, but the changes in the recent law are unlikely to bring significant improvements. WPR: How was the process of crafting this new legislation informed by previous such initiatives? Orias: This new legislation emerged from the 2016 National Summit of Justice, which convened an array of experts to propose solutions to the justice system’s problems. The concluding recommendations from the summit meeting were assigned to a committee from the Ministry of Justice, which prepared and drafted the law and then sent it to be approved by the Legislative Assembly. It was finally enacted after a delay of more than two years, but unfortunately, this process did not include any space for public discussion or civil society participation. As a result, the reform package only partially addresses some of the serious problems that plague the Bolivian justice system, such as corruption, lack of access and judicial capacity in rural areas, and institutional weakness in the merit-based selection process for public servants in the justice sector. Thus, the legislation’s approach cannot be considered comprehensive. It also does not touch on chronic problems in civil, family and especially criminal courts, such as prison overcrowding and high rates of pretrial detention for long periods of time. So, this initiative should be seen as only the beginning of a broader set of reforms that will be required if the justice system is to improve its ease of access, transparency and independence. WPR: What potential impediments remain as the government moves to implement these newly enacted reforms? Orias: Judges for the newly established regional constitutional courts in rural parts of the country were supposed to be appointed through an open and merit-based selection process with the participation of national universities, but that ultimately did not happen. The first call for applications to fill these positions had to be extended and the requirements for applicants’ experience and qualifications had to be relaxed, because very few applicants showed up. So the new reform initiative is showing signs of weakness after barely getting off the ground, and its goal of selecting the best judges in the country seems doomed to fail. Until there is a comprehensive plan that takes on a more structural reform of the justice system through a transparent process that incorporates input from the public and from civil society, the road to transforming the Bolivian judicial system will be long and winding. This entry was posted in Bolivia, Politics, Social Unrest and tagged bad politics, demagogue, democracy in peril, government failures, police and judicial corruption. Bookmark the permalink.